Maureen Anderson is the host of the nationally syndicated radio talk show Doing What Works. As host of The Career Clinic radio talk show I'm often asked, "How do I find my passion?" My answer is always, "Heck if I know. But here's how I did..."
Step one. Catch yourself singing. Once upon a time I hated my cubicle job but I wasn't ready to quit. I took a feature writing class for fun. Our task for the semester was to sell an article to a magazine. The instructor gave me an A- on my first assignment -- a piece about telemarketing -- and lots of constructive criticism. "The lead is, I'm sure, appropriate for the audience," he wrote in part, "but it still is kind of dull." He had to leave early the evening he returned our papers, but told us to stay behind and read what the rest of the class had written. The university choir was practicing down the hall and the music felt like the soundtrack to a movie, my movie. Getting published had been a lifelong dream. To finally be going for it was almost too much happiness to process. The instructor called me at work the next day to ask if I wanted to help him with a book. Did I! From then on, everything revolved around that one evening a week. I sang in the car all the way to and from class. And the boring day job? What day job? I sailed through another few years in a cubicle, daydreaming about the next article and the book and the big plans I had for myself. Suddenly I wasn't stuck in a cube, I had chosen to be there -- while I saved money and plotted an escape from corporate life. Step two. Dip your toes in. Retreat. Repeat. One day I asked the manager of a little airport in town if he'd arrange a flying lesson for me in exchange for an essay in the newspaper about the experience. He agreed, and we became friends. "You know what you should do for a living?" he asked. I did not. "You should host a radio talk show," he said. I can't remember if I answered. I'll never forget my heart leaping at the thought. What did I value most in all the world? Sparkling conversation. What did people consistently tell me they enjoyed about me? Well, that. To get paid for doing it? Wow. Hosting a talk show sounded fun. I turned it over in my head, and decided no one deserves to be that happy. My essay about the flying lesson appeared in the paper. A girlfriend, who wrote a column for the same paper, watched her husband read it and laugh all the way through it. My heart soared again. In the course of about a week I had everything I needed to know about my ideal career, but I was afraid it was silly. I told friends I had no idea what I wanted to do with my life, and I meant it. I believed it with the certainty our forefathers must have felt when they warned Chris Columbus he'd fall off the edge of the earth. I was sure I was clueless about my dreams -- and oh, the irony. Step three. Consider winning the lottery. I mean, really consider it. My first radio job was with the Minnesota News Network in St. Paul. When I was out with friends and they started talking about their work my first thought was always, "I don't work. I go to MNN." When those friends waxed dreamy about what they'd do if they won the lottery I thought, "I'd still go to MNN." Back then my title was "intern" and my salary was "nothing." But I knew I was headed somewhere fun because I was already having fun. Step four. Realize you're in love. I am afraid to die. I know this because for a while, I wasn't. I was writing my first book, and so immersed in work I loved it was as if magic dust had been sprinkled on everything. I was filled with such a sense of purpose and peace that if someone had asked me what I thought about dying, I think I would've brushed off the question. "Well, whatever," I can imagine having said. "I just want to get back to my book." You might think it's silly to put so much emphasis on finding meaning in your work, in being that devoted to it. But I ask you. How do you want your child's teacher to feel about his work? The pilot of your airplane to feel about hers? The doctors who operate on your parent to feel about theirs? Step five. Renew your vows. When does persistence become stupidity? That's what I asked a career consultant when I wondered if a talk show was in my future after all. He answered my question with two of his own. "Do you still want it with all your heart?" But of course. "And do you keep trying new ways to make that dream come true?" Yep. Well, then. Then what? "Then hang in there." I entered the Public Radio Talent Quest in the spring of 2007. I didn't win. I didn't even come close. But the experience reminded me how badly I wanted what I wanted. One day, raw from longing, I asked another colleague what his secret was. He was a social worker turned computer consultant turned motivational speaker and back to computer consultant who had a knack for achieving his dreams. "Write your goal down," he suggested. "There's just something about it." "Yeah, right," one voice inside me snickered. "What could it hurt?" another part of me countered. And like a kid who doesn't believe in Santa anymore but doesn't want to jinx things either, I committed the following to my computer screen: "A real honest to God national talk show." You can guess where this is going. 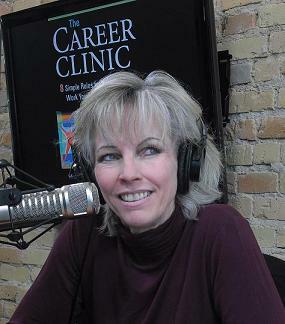 Within weeks I had a meeting with the folks at a brand-new, big station in Fargo -- to talk about what would become The Career Clinic radio show. Hosting that program -- which now airs on 89 stations across the country -- is like being five years old on Christmas morning every week. It never gets old. I hope you'll listen. And if it gives you the encouragement to go after more of your dreams, it will have been a good run.